Now, I've always wished I could draw. I can barely draw a decent smiley face. I even took a basic drawing class but I guess I wasn't born with that artistic gene one needs to be able to draw. Not so, says author Brenda Hoddinott. She says, "...you can learn to draw from a book. As a matter of fact, you can learn to draw very well. How do I know this? 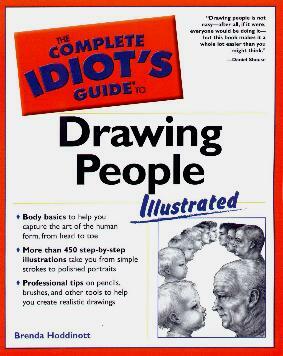 Because this is how I learned to draw." So, there's hope for us all then. We are given a simple start to drawing which is followed by a step-by-step way to add to it and finally managing to create a little something. Areas covered include shading; composition; different lines; light and shadows; blending; proportions; eyes (interesting), ears, and mouths; shapes of figures; sketching, and more. Things can seem a little technical but with lots of practice, you can learn, and continue to learn new techniques. Art supplies are also dicussed so you'll know what you need. Remember that we're all unique and our "artwork" will reflect that. Visit the author's website as well as her other site, Fine Art Education, for more information. There's a handy glossary of drawing terms to help you remember what each means, as well as a useful index at the back of the book. Remember what fun drawing was as a kid? It should be just like that - carefree and uninhibited. Conclusion - Fun and encouraging.